I know, it’s shocking. Not only did I finish one thing, but I’ve finished two! They are Christmas presents but I don’t think the recipients know about my blog, so I’m going to risk it and post it. These are already wrapped, paired with giftcards and sitting under the recipient’s Christmas tree. I decided to get my dad’s family’s presents finished in time to take them to them for Thanksgiving so that I didn’t have to worry about shipping anything. The first one is made with Morehouse Merino that I got at Maryland Sheep & Wool this year. I just used a simple Feather and Fan pattern. The second one is made with yarn that I just got at Rhinebeck from Decadence Fibers. I think it was called Creme Brulee. I loved that all of the yarns were named after dessert! This is the one that I mentioned before, in bulky yarn. I thought it was the pattern that was getting on my nerves, but it turns out it was the needles. I was using size 15 metal needles that were SO loud when I used them. It was that whole "nails on a chalkboard" sensation. I bought some wooden clover needles and it made all the difference. I just used a 1×1 rib and added lots of fringe. And, well, I just realized that I have completely deleted all pictures I took of this scarf, so I guess you’ll see it after Christmas. So not happy about that. Other than scarf making, we went to Thanksgiving in Arkansas (a nice 8 hour drive) and did so much eating and driving that Jason and I each gained a couple of pounds. It was good to see family but also good to be home on Saturday and Sunday to rest and recover. As far as Christmas decorating goes, we have gotten all the boxes out except for the tree, so I have to wait until we can get that out of the attic to really get it underway. Hopefully we’ll make it happen by this weekend. I’ve started a new knitting project but I’ve got to save something for later as my blog posts have been so sporadic lately. So, more soon. I recognize that Morehouse colorway… you copy cat ;-)… oops, I mean best shopping partner around. You are so ahead of the game for Christmas. Don’t worry, those Thanksgiving pounds with melt away with all that knitting. Knitting burns off TONS of calories. 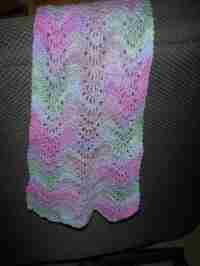 that scarf turned out really pretty!